Arthur Dent is the only human to survive the worst Wednesday ever! On, ‘The Worst Wednesday Ever’, the earth was destroyed by Vogons (a pig like alien race) building a new hyperspace highway! 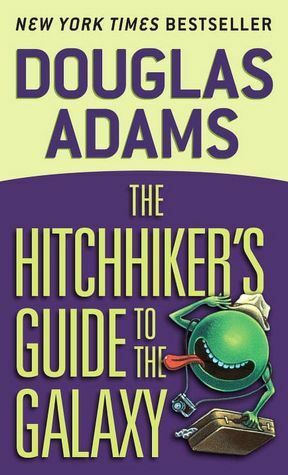 Luckily for Arthur, he and his best friend Ford Prefect, who turns out is an alien from the outer rim of the galaxy, survived the treacherous road works, and stowed aboard the Vogon’s ship. On the begining of what becomes their journey around the galaxy. Unfortunately for them, they’re found hidding aboard the Vogon ship and before they know it blasted into the vacuum of space. But if you think that’s bad, you haven’t even heard the worst of it, The Vogon captain before blasting them into space, made them listen to his poetry, the horror! When you’re unfortunate enough to be blasted into space, there’s almost no chance that a ship will run across your path, let alone pick you up, saving your life in the process. The sheer mass of space is simply to large, the chances too low. What’s going to be different for Arthur and Ford? Surley the main characters can’t die so soon!? TEEN OVERVIEW: A seriously funny, yet exciting book.